Competition Left Driveshaft. To suit all Rover engined models Lotus Elise S1 or S2. ..
Competition Right Driveshaft. To suit all Rover engined models Lotus Elise S1 or S2. ..
Driveshaft Inner CV Gaitor Kit. To suit all Toyota engined models Elise, Exige & 2-11 ..
Driveshaft Inner CV Gaitor. To suit all Rover engined models Elise, Exige S1 & S2. OE..
Driveshaft Outer CV Gaitor. To suit all Rover engined models Elise and Exige. OEM u..
Driveshaft Outer CV Gaitor. To suit all Toyota engined models Elise, Exige & 2-11 OEM..
Lightweight Competition Left Driveshaft. To suit all Rover engined models Lotus Elise S1 or S..
Lightweight Competition Right Driveshaft. 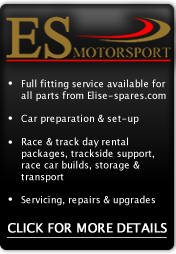 To suit all Rover engined models Lotus Elise S1 or ..